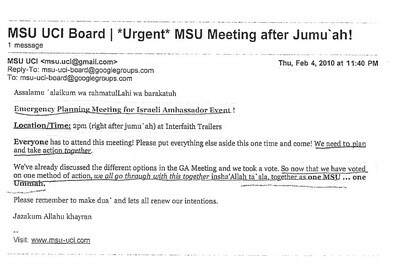 Despite claims to the contrary, internal emails from the University of California, Irvine's Muslim Student Union (MSU) show that the group orchestrated the repeated disruptions of a speech given on campus by Israeli ambassador Michael Oren February 8. A copy of the email exchanges was sent anonymously to school and local law enforcement officials, who are investigating whether students violated conduct codes or criminal laws, respectively, in deliberately disrupting an invited guest speaker at the school. The emails include a "game plan," which details the disruption plan down to where the student disruptors would sit, how they would communicate with each other via text messaging, and how to act if campus police began to arrest students. The Investigative Project on Terrorism also received a copy of the packet sent to UCI officials. During his speech, Oren was interrupted more than a dozen times by students who stood up and shouted that he was a murderer and a war criminal. He left the stage for about 20 minutes before order was restored and he was able to continue his remarks. Prior to the speech, MSU officials told UCI administrators that they were not planning any disruptions before the speech. Police arrested 11 students during the event, eight from UC Irvine and three from UC Riverside. Afterward, numerous press accounts included MSU denials that the disruptions were orchestrated. "It was not put on by the MSU, but rather by students acting on their own," chapter spokeswoman Hadeer Soliman told the Los Angeles Times. She repeated the claim in a column in UCI's student newspaper. On a website created to support the arrested students, MSU President Mohamed Abdelgany wrote that "all of my actions on Monday were done out of my own individual accord and were not on behalf of the Muslim Student Union or any other organization at UC Irvine." 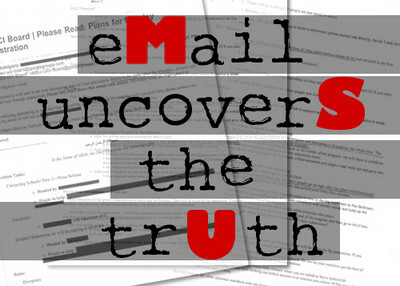 As the now public emails make clear, these denials were an attempt to cover up the truth about MSU's behind-the-scenes attempt to shout down a visiting diplomat. A decision to disrupt the event had been made at an MSU board meeting days before the speech, the records show. Meeting minutes also included in the packet show the ultimate objective was to stop Oren from being heard. "[O]ur goal should be that he knows that he cant (sic) just go to a campus and say whatever he wants." Members were advised to "push the envelope," in order to "realize our role as the MSU of UCIrvine." Further, Hussaini wrote, MSU members should voice support for the 11 arrested students, but try to steer the conversation away from the controversy and "always try and bring the discussion back to Islam." The MSU is a chapter of the Muslim Students Association, a national organization founded in 1963 by Muslim Brotherhood members who came to the United States for college educations. The Irvine MSU is considered among the most extreme chapters in the country. It routinely invites radical speakers to campus and organizes events considered by some to be not only harshly critical of Israel and supportive of terrorist groups like Hamas and Hizballah, but also anti-Semitic. "That's what Adolph Hitler did, isn't that right? He burned the Reichstag himself. They blew up the World Trade Center, blamed it on us, and then come out with the Patriot Act and all these criminal laws. Right?" And Sabiqun has a goal of creating "the Islamic State of North America no later than 2050." "Barack Obama is a deception; a very dangerous, dangerous deception because we look at him and we say 'change.' And he chose Rahm Israel Emmanuel as his chief of staff. 'Change.' Madeleine Albright can go and represent him at the economic summit. 'Change.' David Axelrod, chief advisor. Zionist. 'Change.'" This is not the first time the MSU has been investigated for lying to UCI officials. Last fall, the school launched an investigation into an MSU fundraiser held on campus last May to benefit Viva Palestina, a group founded by British MP George Galloway that is suspected of giving support to Hamas. When filling out the event registration form, the group stated that the event would not be a fundraiser. California Congressman Brad Sherman wrote to Chancellor Michael Drake in December, saying an investigation would find MSU knowingly helped solicit for a terrorist organization. He called on UCI to kick the MSU off campus until its leadership is replaced. "Each disruptor will be given a statement on an index card on Monday. There will be no on the fly statements," it said. It urges the disruptors to be loud, but under control. "Remember that this is a planned/calculated response and not a venting session." UCI officials did receive copies of the packet, said university spokeswoman Cathy Lawhon. "Our legal counsel is attempting to verify the authenticity of them at this point since they were sent anonymously," she said. She could not answer questions about the possible ramifications of the emails' content, citing student confidentiality rules. If the MSU chapter itself is punished, however, that information may be released. Section 102 of UCI's student conduct code calls for discipline in cases of "dishonesty including but not limited to fabricating information, furnishing false information, or reporting a false emergency to the University." In addition, university police have published a guide to "Freedom of Expression" on campus. It cites California penal code language on disturbing the peace, which includes anyone who "maliciously and willfully disturbs another person within any of these buildings or upon the grounds by loud and unreasonable noise." "Persons who choose to exercise their freedom of speech or right to public assembly should understand that such rights are not unlimited. When the activity infringes on the rights of others, the activity loses constitutional protection and may become a violation of law or University policy." That caveat may help explain the students' insistence that their disruptions were spontaneous. A day after the Oren speech, UCI sent letters to the students who had been arrested and to the MSU chapter indicating the school was investigating what had happened. Meanwhile, Oren later issued an open letter to the UC Irvine student body in which he offered to "return to your campus and meet with those individuals whose views may not agree with mine as long as we respect the decorum of dialogue and free speech." He lamented that a group of students tried to hijack his original appearance. Oren's letter drew a rebuke from Reem Salahi, an attorney for the students, who called the "hijack" characterization "both racist and Islamophobic." Salahi should speak with one of her clients about his own language. In preparing the plan, MSU President Mohamed Abdelgany said he expected Oren to try to ignore the outbursts. "And if he starts just reacting to us, then the program will have essentially been hijacked." To let the VIRUS propagate abroad, thinking fronteres can stand firm against fondamentalisme!! Please, don't make the same mistake to tollerate this serious viral alert! ...Turkey and now American universities! We were not lucky or as aware as we should have been 31 years ago ! For Khomeyni was patient Zero! Well, ... good luck ! Our culture has become obsessed with being politically correct and Teabag is right authority cowers when these Islamic maniacs raise their ugly heads. What we need are leaders with the intestinal fortitude to face them down and say NO. We The People MUST vote out those who perpetuate this dangerous nonsense. They're giving us the rope, but why put it around our necks? What amazes me, is that the extreme Muslims tell us exactly what they intend to do - like destroying us from within. Yet we allow them to come here, study in our schools, spread anti-Semitism, push for Sharia law, and call us racists and bigots when we point out what they're doing. They break our laws, from lesser ones like suppressing the free speech of others, to major ones like raising funds for terrorist organizations. Why aren't they investigated, confronted with the evidence and, if citizens, thrown out of the schools, or if not citizens, deported. Why do we let them get away with this? Drake is scared of the radical islamists, and the radical islamists are scared to allow a Jew's comments to be heard, uninterupted. I don't know what their fear is, but they're obviously intent on the speech not being heard, so they must be afraid of SOMETHING! What a loser organization that would plan such a hypocritical move and then lie to cover up the fact that they planned it! I say kick 'em out of school, and if they're here on student Visas, kick 'em out of our country! That is the solution for those who come to this country for study but are unwilling to abide by it's laws.